Sarah Morales has always been interested in the health field, in education, and in working with young adults. Sarah Morales has always been interested in the health field, in education, and in working with young adults. Since July 2017, she has been able to incorporate those interests into her job as a health educator with Health Initiatives, working with the Tech community on a variety of health topics. Health Initiatives’ five-dimension model of well-being includes the aspects of: professional, physical, social, emotional, and spiritual. Health Initiatives is well known for nutrition appointments, contraception availability, VOICE (sexual violence prevention), and free HIV testing offered twice a semester. One of Health Initiatives’ signature programs involves Well-Being Activators, where student or employee representatives from various departments and organizations help others make healthy choices. This fall, Morales and a colleague, JaPeera Edmonds, are focusing on the Healthy Jackets Peer Education Program. They are recruiting students this fall, then, in the spring, they will extensively train the first cohort of students to plan and implement health programs for their peers. 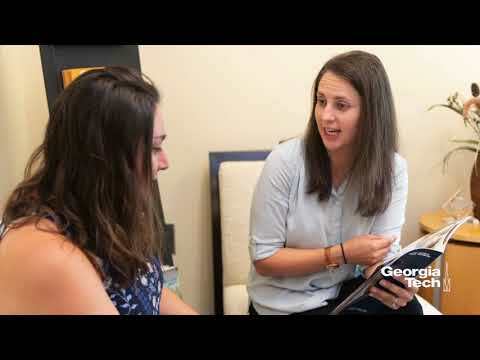 Morales has a bachelor’s degree in environmental studies from Mount Holyoke College in Massachusetts, and a master’s degree in public health from Emory University with a concentration in behavioral science and health education. She also is a certified health education specialist. Before coming to Tech in 2017, she was in an AmeriCorps program called City Year where she worked in an eighth-grade science classroom. Then she worked in elementary special education for two years. While at Emory University, she interned at the CDC and Georgia Tech. After graduating, she worked for the city of San Antonio, Texas, in its Healthy Start program, supporting pregnant women and mothers in low-income communities. Away from the office, Morales and her husband, Gilbert, like to explore hiking trails, try new restaurants, and browse local bookstores. Morales also takes time to pursue her lifelong tennis passion. She grew up playing in junior tournaments, and she was on her high school and college teams. She also was a ball girl for the Family Circle Cup — and got to be on the court with players such as Venus and Serena Williams. Now, she plays on two Atlanta Lawn Tennis Association (ALTA) tennis leagues: women’s doubles and mixed doubles. Morales and her tennis partner, Sutton Boling, came in second place in the city finals last spring.